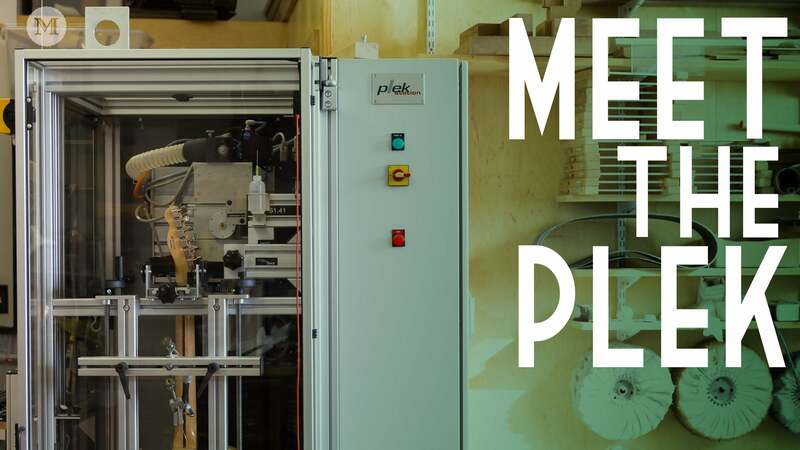 The Plek Pro has been developed for use in guitar production factories as a tool that not only does precise fret dressing but also helps with quality control and R&D. This computer controlled device scans and dresses a guitar under actual playing conditions, strung and tuned to pitch. This is a major breakthrough since the Plek Pro identifies precisely what needs to be done for perfect fretwork, executes this rapidly, and delivers perfect results on the instrument when restrung. As a result of a new electronic and hardware concept, upgrades do not require special effort. The Plek Pro represents uncompromising modular design that makes it easy to develop and add additional tool modules and process features. Its measuring and graphic display capabilities open up a wide range of R&D applications. For example, one important use would be studying the workings of the truss rod and how it affects the neck. Fingerboard issues can be evaluated in accurate 3-D, the effect of humidity and gluing procedures can be studied, and instruments can be observed over the long term for stability and setup issues. "Our PLEK has been a tremendous learning tool. In a lot of ways, it's become the heart of our operation in that we've geared our production processes around producing the results that we measure with the machine. It allows us to make predictions about our instruments and gives us confirmation that we're on the right track." The impact of material defects, manufacturing problems, and customer returns can be studied and will decrease. Plek Pro creates printable graphic feedback to improve employee performance. Consistency of innumerable manufacturing processes can be seen and stored for later comparisons. A permanent record of all instruments remains in the database for later reference as needed.